This fun center will surely engage all students and can be played individually or in small groups. Students assemble the puzzles by matching each numeral with corresponding number representations (ten frames and base ten blocks) and equations (10 + ?). 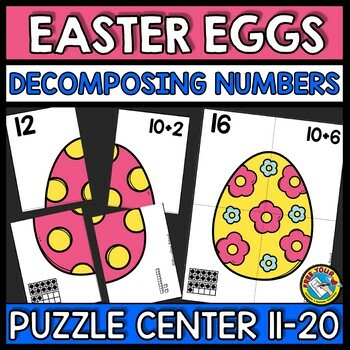 This game provides children with adequate practice to reinforce decomposing numbers into tens and ones. Children will surely have a blast! 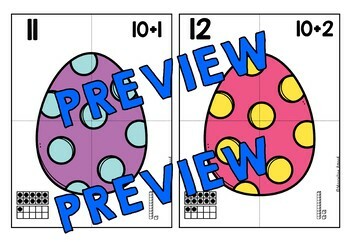 With this download, students can assemble 10 puzzles, one for each number from 11 to 20. This resource is easy to prepare. Simply print on cardstock paper and cut out. (You could also laminate the pieces). 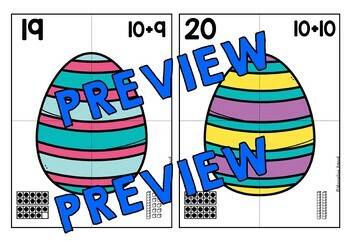 Place all the puzzle pieces in a folder or envelope and give it to your kids to assemble.